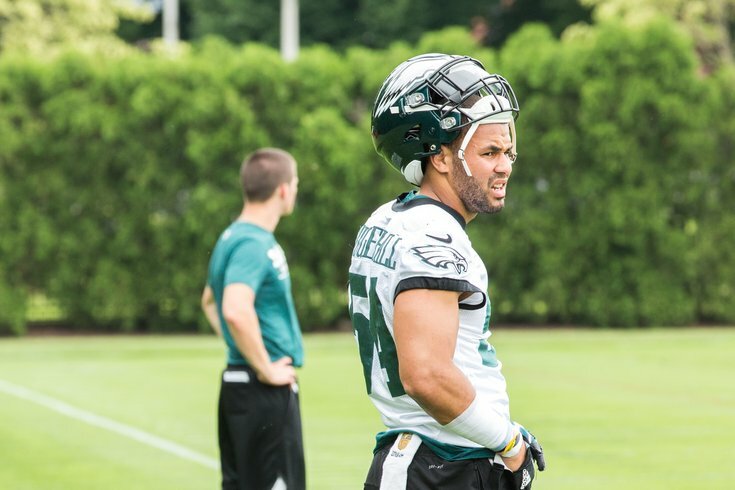 Kamu Grugier-Hill during OTAs at the NovaCare Complex. Heading into training camp, the 2018 Philadelphia Eagles don't have much in the way of camp battles, especially at the starting positions, but one interesting competition to watch will be the third linebacker spot after the Eagles released Mychal Kendricks. Still, it's an opportunity for one of three Eagles linebackers to earn a role in Schwartz's defense. Nelson, Grugier-Hill, and Gerry all have some traits in common. All three players are undersized, and specialize in coverage. • At 6'1, 226, Nelson is the heaviest of the three linebackers. Grain of salt warning here, but Pro Football Focus had Nelson as the second-best linebacker in the NFL in coverage in 2016 (his last full season) behind Jordan Hicks, in terms of passer rating allowed. • Like Nelson, Gerry is another undersized linebacker at 6'2, 218 who played safety in college at Nebraska, where he was something of a ball hawk, picking off 13 passes his last three years there. In the same way that Schwartz likes his safeties to have some cornerback in their backgrounds, the same can perhaps be said that he views it as advantageous if his linebackers have some safety in their backgrounds. • And then there's Grugier-Hill, who is the most tenured Eagle of the group, but has almost solely been a special teams contributor in his time with Philly. Like Gerry, Grugier-Hill was listed as a safety coming out of college. However, he corrected that label in an interview in June. "I played a hybrid role (in college)," he said. "I covered tight ends, I was in the box, I did a lot of run (support). My position was never ‘safety.’ I was more of a ‘hybrid linebacker.’"
When asked what his strengths as a linebacker are, Grugier-Hill gave an unsurprising answer. "Definitely speed," he said, "and my ability to play pass coverage." As we noted in our training camp preview of the linebackers, the physical measurables Grugier-Hill posted at his pro day are similar to Mychal Kendricks' NFL Combine performance. Grugier-Hill was built more like a big safety when he entered the league, and has since put on some weight. Still, the point here is that Grugier-Hill, like Kendricks, is something of an athletic freak. There is very little in the way of game tape of Grugier-Hill playing linebacker in a regular defense. However, in the Eagles' meaningless Week 17 regular season finale against the Dallas Cowboys, Grugier-Hill played most of the game. In my view, he looked like a legitimate linebacker, and showed some positive signs. The following is a cut-up of some of his notable snaps in that game, with analysis to follow thereafter. • (:04) Blitz. Kamu hesitates for a moment when he sees Witten coming across to block him. Ideally, you’d prefer no hesitation there. Steven Means cleans up on the sack, with Kamu getting in a little late. • (0:12) Kamu takes on the fullback in the hole, bounces off the block and gets in on a tackle of Zeke Elliott for a gain of 1. • (0:19) Another blitz. This time Kamu is easily cut-blocked by Elliott. • (0:25) Man coverage on Witten – Negates him. • (0:37) Man coverage on Witten – Again, no separation at all by Witten. Kamu then comes off his man coverage and minimizes the damage on a Dak Prescott scramble. • (0:44) Zone coverage. Kamu reads the play, breaks on a little dig rouge by Terrance Williams. Gain of 3. • (0:52) Zone coverage. Elliott has alligator arms on an off-target throw by Dak. With more experience (and thus more aggressiveness), maybe Kamu picks this. Still, golf clap for being in the area and helping cause the incompletion. • (0:59) Elliott cuts back Kamu’s way after initially running in the opposite direction. Kamu is the beneficiary here of horrendous effort by Cowboys LG #73. • (1:06) This is a double A-gap blitz by Kamu and Najee Goode (52), with Corey Graham (24) coming up the middle on a delay. It looks to me like Kamu makes an unselfish play by going around the back to the outside to clear a wide open clean shot for Graham, rather than taking the shortest distance inside to the QB. If so, well done. Good team football, and understanding of the blitz design. • (1:13) Here we see Kamu’s speed, and ability to run “sideline to sideline,” as he not only gets in on the tackle, but actually cuts off the sideline. On a side note, watch Nate Gerry (47) on this play. He takes on a La’el Collins block and then makes the tackle. That’s really well done. • (1:20) Man coverage on Witten – No separation. • (1:27) Man coverage on Witten – Nice jam, no separation. • (1:33) Man coverage. Kamu has the fullback. He aggressively meets the FB in coverage near the line of scrimmage, tries to affect the throw with a batted pass on Dak’s delivery, then hustles downfield to try to make a tackle, and drew what should have been a block in the block. Well done. • (1:42) Blitz. Decent job disguising the blitz, then makes the RB whiff in pass pro, helping cause a throwaway. • (1:48) Run play. Witten is trying to get to the second level to block Kamu, but has no chance with Kamu’s speed, and Kamu gets in on the tackle. There were seven plays from the Cowboys game worth showing in which Grugier-Hill was in coverage. While that is obviously an incredibly small sample size, he looked comfortable in coverage both in man and in zone. If indeed pass coverage is the most important trait for a Jim Schwartz linebacker, Grugier-Hill is in the right scheme. While he isn't Ray Lewis against the run, Grugier-Hill also showed willingness to stick his nose in there against the run, and has athletic traits that will enable him to make plays on the edge using his speed. It is my belief that with more experience, he can be competent against the run as well. Grugier-Hill may very well have every bit as good a chance of winning the third linebacker job as Nelson or Gerry.